KVO Collections likes to name pieces in their collection after people who have had an impact on our lives. 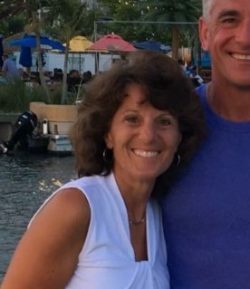 Today, I would like to tell you about a woman named Julie Ramsey Emrhein, who I knew at Dickinson College. I played field hockey there and I came to know Julie because she was an athletic trainer and an extremely talented one too. I loved Dickinson especially since there were so many amazing people there, but those years were also very difficult times as my mom had kidney failure and was living on dialysis and having all sorts of complications and my dad was diagnosed with stage 3 colon cancer and was under going Chemotherapy. Between those issues at home and the up and downs of college life, I sought refuge in the training room with Julie. She became my close friend and confidante at a time when I really needed a person who was warm, kind, insightful, grounded, and who always had a smile on her face! I rarely talked about my situation because I was shy about it and quite frankly quite scared, but Julie was there always willing to listen. She got me through moments during that time when I wanted to just quit and bury my head in the sand. Julie is exceptional in what she does and it’s in part because she is such an amazing beautiful person inside and of course outside too. We had kept in touch for a bit but then life got in the way and now I am connected only through Facebook. There are times when we come across people in our lives who make an impact and many times that person does not even realize it. So Julie, I know I said thank you when I graduated from Dickinson, for all you did for me, but I wanted to make sure you knew that your thoughtfulness and kindness to me is something I will never forget. 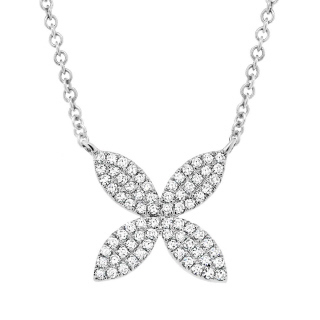 So we would like to name this flower necklace after Julie. Flowers are gentle and sweet and they have a presence that gives feelings of hope. Julie provided me a gentle and sweet space to be myself and helped me through a tough time, and her talks and friendship gave me hope that everything would be okay regardless of what happened. So may we present you with the Julie necklace…..